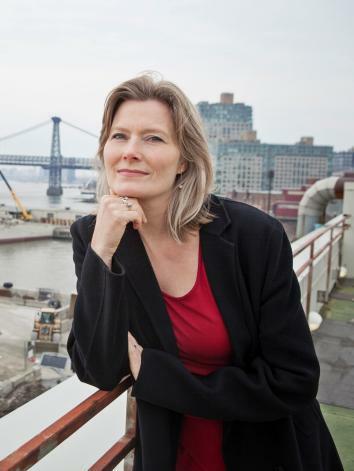 Jennifer Egan’s Manhattan Beach, reviewed. Jennifer Egan’s first novel since Goon Squad is very conventional World War II historical fiction. It’s spectacular. Photo illustration by Lisa Larson-Walker. Photos by U.S. Military, Library of Congress. Manhattan Beach is not the book anyone expected from Jennifer Egan. Before this latest offering, Egan seemed most interested in modern life as a neon-lit carnival where continuity breaks down. Her Pulitzer-winning, reputation-making novel A Visit From the Goon Squad—really a linked story collection, flickering on the line between the recent past and the near future—fractured into different narrative styles, including one showcase chapter written as a PowerPoint presentation and another as a celebrity profile. By contrast, Manhattan Beach is sober, even staid, a historical novel set in World War II–era New York City. It’s delivered not in the sparkly, fast-acting fragments of mass and digital culture—the fictional equivalent of espresso shots—but in long, deep draughts like tall glasses of ice water. Whether or not it hits the spot depends on just how thirsty you are. It turned out I was parched. Reading Manhattan Beach feels restorative rather than challenging at a moment when, as late-night talk show host Jimmy Kimmel put it, responding to the Las Vegas massacre, most of the time “it feels like someone has opened a window into hell.” Egan embraces some of historical fiction’s most familiar and comforting devices, from the spunky young heroine who insists on pursuing a trade usually reserved for men to the nostalgic invocation of a time when Americans felt themselves to be united in a worthy, essential cause. The novel has three main characters: Eddie Kerrigan, a former stock-market player forced by the Depression to scramble for waterfront work to support his wife and two daughters; Anna, the elder of Eddie’s daughters, who takes a job at the Brooklyn Naval Yard during the war and aspires to be a civilian diver working on battleships; and Dexter Styles, a suave operator on the borderline between the Mafia and high society, managing nightclubs while married into a WASP clan whose patriarch counts FDR among his chums. Early in the novel we learn that one day during Anna’s adolescence, Eddie vanished, leaving behind an envelope of cash and the passbook for a previously undisclosed bank account. What happened to him is the novel’s central mystery. Did he run afoul of the assorted gangsters he had to consort with to get by in 1930s New York, or was he fleeing his own inability to cope with Anna’s sister, a severely disabled child doted upon by his wife? Egan gets to this question at a leisurely pace, offering up long, carefully detailed descriptions of Anna’s work, from the dullness of measuring machine parts to the job she stubbornly pursues underwater. In the pre-scuba era, divers, suited in more than 100 pounds of gear, breathed through a tube connected to an air pump on the surface. This was, as Anna’s unsympathetic supervisor repeatedly explains, insanely dangerous; even an accident as simple as tripping into the East River with your faceplate open spelled certain death, the water rushing into the heavy suit and sinking the diver to the bottom within seconds. Parts of Manhattan Beach are a shade hokey. Its Irish mobsters are the stuff of Jimmy Cagney movies, its Italian ones straight out of The Godfather. Dexter carries a “gat” and his dialogue often seems written to be delivered by some oily, half-forgotten heavy of the 1930s, like George Raft: “Say, you’re going the wrong way, boss.” “That all depends where I’m trying to go.” The antediluvian capo he reports to tends a vegetable garden and speaks, Brando-style, in a voice that is “barely more than a whisper … the rumbling, soupy force of a primeval exhalation.” The novel’s male leads are notably, and perhaps preposterously, chivalrous. The nasty hazing Anna encounters as the only female trainee for the Naval Yard’s diving program eventually gives way to respect for her stamina and courage. The other misfit rookie, a black man, gets accepted, too. from one moment to the next, as if turning an oven dial and feeling a hot gush of flame in reply, the scene around Anna softened into a smear of brightness—music, sparkle, laughter—an impression, as Pearl Gratzky would say, glimpsed from the corner of her eye, more than an actual place. And this change dissolved whatever barrier had been stranding Anna outside of it. She was vaulted into its midst, hot-cheeked, with a galloping heart. 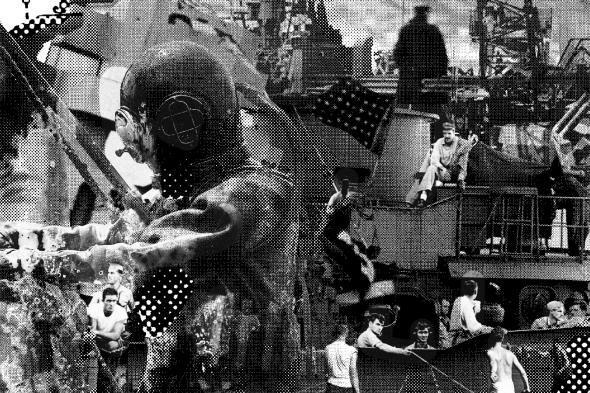 The sea, the war—Egan’s characters crave contact with these immeasurable forces, something bigger than themselves whose very threat is clarifying. They want to be overwhelmed, the ambivalence driven out of them, along with all the chatter, trivia, and pettiness of ordinary life. Who can blame them? Manhattan Beach gives its readers a portion of that stately clarity, and it is very, very welcome. Manhattan Beach by Jennifer Egan. Scribner.